← Alberta BearSmart – Spring is Here! Today is the day – its field day! A definite favourite part of the job amongst many of the biologists working on the grizzly bear project. It doesn’t feel much like work when you get to be outside exploring the world around you! The morning is fresh and bright, and we’re eager to start the day. Although it’s a little cloudy, this doesn’t dampen our spirits as we head out on the road to begin our grizzly bear hair snag set-up. As we make our way, the truck loaded to the brim with gear and pulling a trailer with our trusty side-by-side, the sun starts to peek through the clouds, energizing us for the day ahead. After a bit of a drive, we’ve made it to our first site. Despite what started out as a lovely morning, the sky darkens as we start to unload the truck and we feel the threat of rain. Welcome to springtime in Northwestern Alberta! Luckily, we’ve come prepared – in this job, you have to be ready for anything! With our gear unloaded, we head out on the side-by-side… and that’s when the mud starts to fly! With all the rain we’ve had over the past couple of weeks it makes for an exciting ride! The roads and trails are okay for the most part, except for some very obvious washouts, potholes and ruts. Needless to say, the side-by-side is working very hard and we are getting a mud bath! Luckily, our trusty machine is able to get us to pretty much all of our sites, and we make new ones where needed. At each of our sites, the hair snags are set with barbed wire pulled tight, approximately 2.5 – 3 ft off the ground, and about 6 ft in diameter. When a bear visits the site, the barbed wire serves to snag clumps of hair as the bear rubs against it. In order to attract bears to the area, these sites are scented with a natural lure poured on the ground in the center of each snag site. Our sites are signed and labeled, and approximately placed in each township across Bear Management Area 1 (BMA1). Wherever possible, we make sure to set the snag sites in habitat that would most likely be used by bears, such as wet meadows or stream banks, gully bottoms, groundwater seepage areas, regenerating burns and clearcuts. 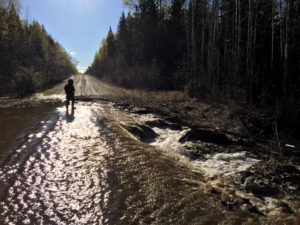 Over the coming field season, we are excited to be working across BMA1 alongside our delivery partners, Alberta Conservation Association (ACA), from mid-May until mid-July. Our next visit out to the field will be to collect bear hair, set camera traps, and of course, continue the fun! !